Hands up if you love stationery!? I'm yet to find a blogger out there who doesn't, and writing up stationery posts are actually one of my favourite things to do. Aside from, you know, buying stationery, using stationery, and gushing over stationery. It's safe to say, I'm a tad obsessed. I've written posts in the past professing my love for all things pen, paper, notebook and sticky note-related, and I thought it was about time I did another, with a few new things which have recently entered my endless collection of 'back to school'-esque goods. I always find September the best month for stationery lovers - it's when the shelves of WHSmiths and the like become full to the brim with more folders, pens and pencils and lined paper pads than you can shake a sticky tape at. I adore it. As I know some of my readers will be heading back to school, college and uni this month, I thought now was the perfect time for a good old gush about stationery. One of my favourite places to buy my stationery from has got to be Paperchase. The above kitten book is actually from there, and a great deal of my favourite stationery bits also are. The only downside to Paperchase is the price - it certainly isn't the cheapest, and so a splurge in there can really leave your purse looking a little sorry for itself. However, they currently have 15% off online for students so that's definitely worth checking out. On the other side of the spectrum, places like Wilko are really good when it comes to affordable stationery. Nowhere near to the quality of Paperchase, granted, but you don't always necessarily need great quality when it comes to things like post-it notes and plastic files. The Parisian-themed plastic folder above is from Wilko for a mere 80p or so and it does the job perfectly fine. A stand-out brand I've recently discovered in the stationery world is Galison, which has some of the cutest stationery around (it's just a case of hunting it out). The above cupcake post-it notes and macaron notebook are both by Galison, which is actually available to buy online - hooray! I've become a bit obsessed with Sharpies lately, and the neon ones above were a steal from Asda in the sale. The sticky dividers are from Staples in their Martha Stewart range, which is a girly girl stationery lovers dream. Seriously. Other shops I find are fab for stationery purchases are the likes of WHSmiths, The Works, and even supermarkets like Tesco and Asda have a great range. Online-wise, Amazon can be a great place to find stationery goodies, and are particularly good for things like cool Post-It note dispensers and funky features for your desk. If you send parcels/envelopes out a lot through having your own business, using Ebay, selling things regularly on Depop or even having a penpal, I think another great website for funky envelopes to pack your parcels etc. in is Envelopes24, which has everything from brightly coloured envelopes to these groovy pink bubble ones. I've never seen a website with such a wide range of envelopes before so definitely thought this was worth a mention. Also, if you're a fan of Kawaii stationery (and I certainly am) Tofu Cute is a fab website to find some cool stuff on. Also, if you search on Ebay for 'kawaii stationery' you'll find some amazing bits and pieces, just be sure to check where they're shipping from as they will take ages if they're from Hong Kong/China. 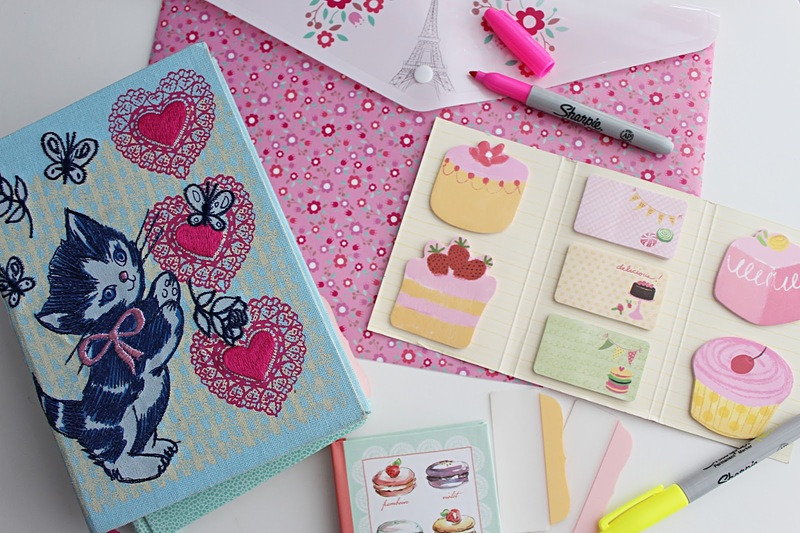 Where is your favourite shop for finding stationery? Are you as obsessed with it as I am?